Qualifying for the second race produced a 13th fastest lap for a seventh row grid start for the second race. However, a last lap clash with Carlos Sainz ended with both drivers in the gravel and retirement from eighth place for Jazeman. 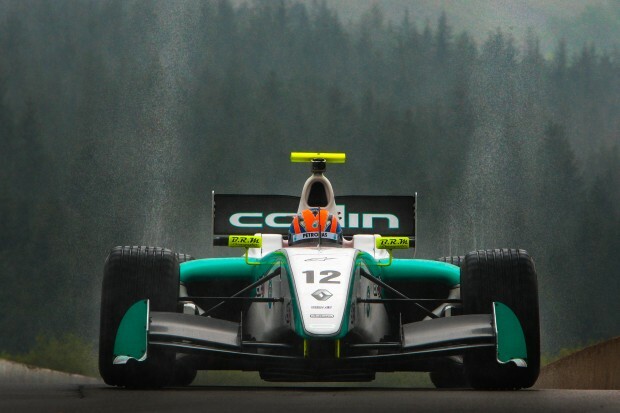 The Spa-Francorchamps circuit was shrouded in fog on the first morning, delaying the practice session for Jazeman and the Renault FR3.5 Series drivers. With rain still falling after earlier heavy showers the drivers were forced to use wet tyres to start the weekend. With a new compound for this tyre being used for the first time, Jazeman used the session to learn about their characteristics finishing 10th quickest at the chequered flag. 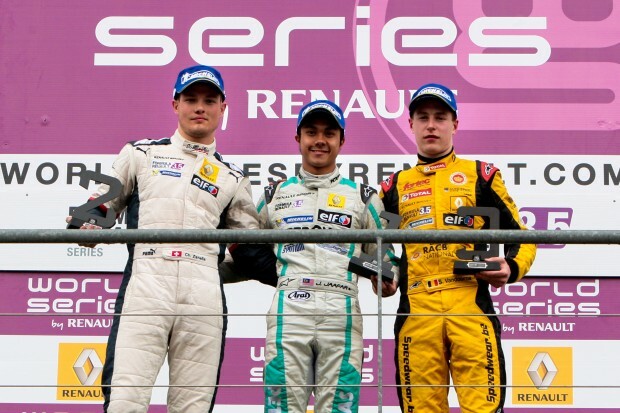 In the afternoon conditions changed and a dry track proved a different challenge for the Renault FR3.5 Series rookie. After 30 minutes of track time, Jazeman was 18th quickest of the 26-car strong field. Saturday morning’s qualifying session for the first race was delayed for over two hours due to dense fog which left visibility severely limited. After patiently waiting for the mist to clear, the session was green flagged, although shortened to 20 minutes running time. Jazeman was quickly out on his first set of tyres and settling in quickly to post second quickest time. As the session progressed the times tumbled and Jazeman kept high up the leader board, finally posting third quickest lap on his second set of tyres for a second row starting position. Sadly the race didn’t live up to Jazeman’s expectations with the young Malaysian struggling with excessive wheelspin on the grid which slowed his getaway and left him in the melee of the pack as he raced down to the first corner. Pushed wide in the shuffle Jazeman dropped to 10th place. With gritted determination Jazeman fought back to retrieve one place and lie ninth, however with degrading tyres he was unable to make up more ground, finally finishing the race in this position, earning two championship points and claiming the winner’s spot on the rookie podium. Qualifying for the second race took place this morning with sunshine bathing the Spa circuit for the session. Jazeman took to the track on new tyres for the first of two runs, but wasn’t able to get the best out of them leaving him 17th quickest. A few quick set-up changes by the Carlin crew helped the 20-year-old driver to improve on his times in the second run with a lap in the final minutes putting him 13th on the grid for the second and final race of the weekend. Jazeman made a storming start to lie ninth at the end of the first lap. A safety car period after a 4 car incident slowed the pace of the race for a few laps, but as soon as the green flag flew again Jazeman quickly set about pushing hard and with a pair of cars ahead tangling, he pitted from sixth place. The Carlin crew quickly changed Jazeman’s two rear tyres in the mandatory pitstop and Jazeman was soon back out on track and racing hard again. He was in a tight pack of cars vying for sixth, seventh and eighth positions, with Jazeman lying eighth and keen to improve on his position. As the race drew to a close he was close on the heels of Carlos Sainz and hounding his rival hard. He saw his opportunity to make a pass on the inside of Sainz, but Sainz turned in and pushed Jazeman off track and into the gravel, ending Jazeman’s race. 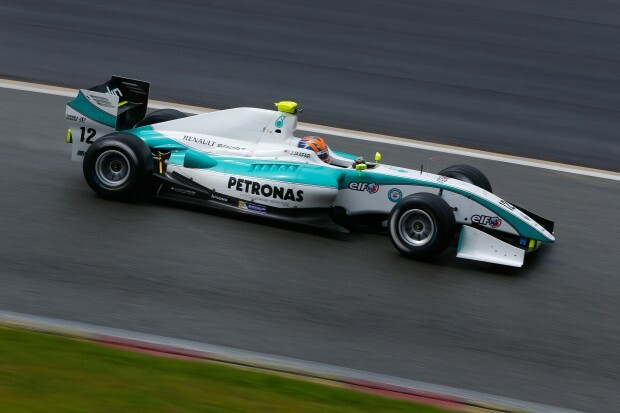 Jazeman will soon head to the next round of the Formula Renault 3.5 Series, with his first visit to Russia for the fifth round of the championship.